(Cucumis sativus L. var. 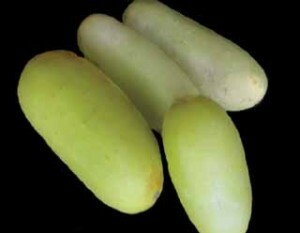 sativus) also known as Poona Kheera Cream/light green fruits, have very delicious flesh, crisp, juicy, sweet and mild. Fruit is shaped like a potato, with skin turning brown. Very strong vines give huge yields, and are also early. Poona Kheera does extremely well in hot, arid climates, as in the Western States where it is difficult to grow other cucumbers. Approx 20 seeds/pkt.